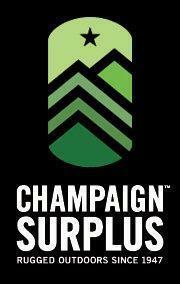 Champaign Surplus is a unique, independent, specialty outdoor retailer located in Champaign, Illinois. We pride ourselves on being a third generation, family-owned business, known since 1947 for our outstanding customer service and industry expertise. For over 65 years, we’ve offered our customers the highest quality products from leading brands such as The North Face, Columbia, Patagonia, Keen, Smartwool, Marmot, Mountain Hardwear, Osprey and Merrell, as well as the best in military surplus and tactical gear.